Why we love her look: We couldn't resist Sarah's knack for pattern-mixing with an ensemble that balances a black-and-white tribal blouse with Steve Madden leopard loafers. The key to making it all work? 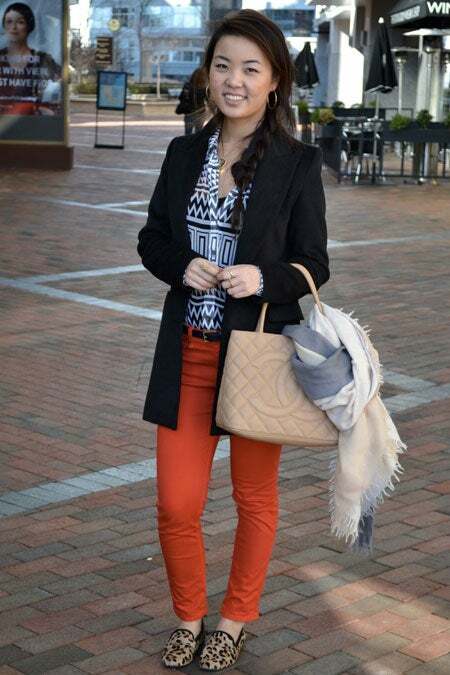 A bold dose of color with a pair of Rag & Bone tangerine skinny jeans, a neutral, oversized blazer she scored in Shangai, and understated accessories. What do you think of her look? Can you pull off bold bottoms like these?